It’s Tweet Tasting time again, and this time not whisky, not gin, but a foray into another great love of mine, rum! We are making like pirates and joining esteemed rum writer and founder of The Floating Rumshack (@FloatingRumShac), who will be our host for the evening and will chart our course through this quartet of rums (yes, I will be getting as many pirate themed puns is as possible, sorry), and Havana Club’s International Brand Ambassador Meimi Sanchez (@_HavanaClub). We will be sailing into the deep of the Icónica Range which comprises Havana Club Selección de Maestros, Havana Club Aňejo 15 Aňos, Havana Club Unión and Havana Club Máximo Extra Aňejo. I am super excited about this tasting, I love rum, and these are of the finest quality, so let’s tell you a little about them. A relaunch of Havana Club’s Cuban Barrel Proof edition, Seleccion de Maestros has benefited from an eye-catching packaging upgrade and is bottled at 45% for extra oomph. 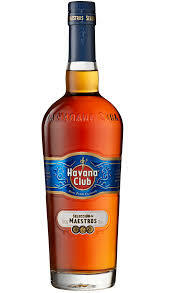 The Gold Medal-winning liquid inside Havana Club Seleccion de Maestros remains the same as for the old Cuban Barrel Proof – as the name suggests, the casks have been hand-picked by the Master Roneros from the company’s finest aged stocks. The rums selected by the Roneros are finished in special casks chosen for their aromatic properties before being bottled at a higher strength than the standard range for a more intense, immediate flavour on the palate. Butterscotch sauce, Brazil nut toffee, with root ginger and a touch of liquorice. There is some cinnamon spice, juicy raisins and hot pink peppercorns. Soothing cocoa butter with a little mandarin, silky almond frangipan, with spun sugar baskets and vanilla tablet with a hint of sea salt. Sticky treacle scones and lashings of warm maple syrup and pecan pie, just slightly over done. Orange peel, cloves and vanilla pods. Buttery pastry layered over baked apples and sultanas, grilled pineapple drizzled with honey, and a crisp sugar edge. The sweet notes linger on, but there is an unmistakable touch of cedar and dried cigars, with damp toasted oak and pipe smoke combining with, vanilla, peaches and maple syrup still at the fore with a ginger spice tingle. 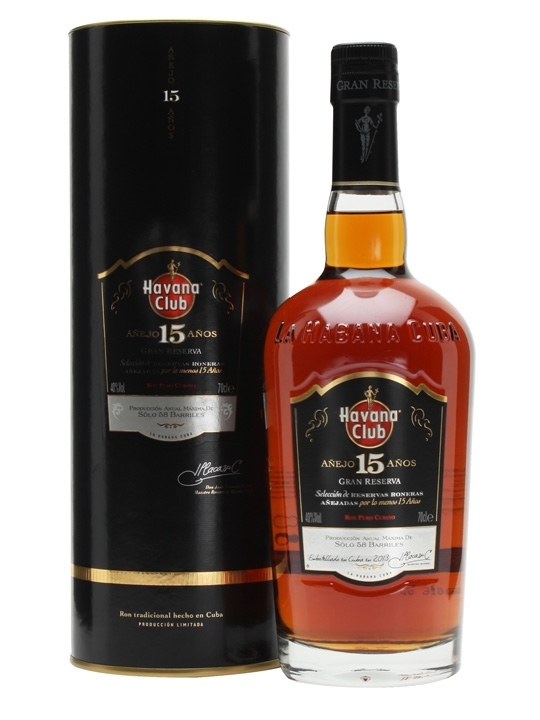 Havana Club Añejo 15 años has always been produced in very limited quantities – only 58 barrels a year through a process of blending and ageing in old oak barrels selected rums and aguardientes several times. The name “Añejo 15 años” means that what you have in your hands is a fabulous final blend elaborated with rum reserves that have been aged for at least 15 years. Minimum age is 15 but it’s a blend of rums from 15 to 35 years old. This unique ageing process helps develop truly distinctive aromas and flavours and gives the extra smoothness that is the hallmark of a top quality rum. Sweet sticky orange marmalade on white buttered toast. Creamy milk chocolate, ripe bananas, vanilla pods, cream soda and a welcome touch of mint. Fresh sponge dusted with icing sugar, juicy plump raisins, Christmas cake spices, and stewed plums, sticky dates. It then takes a touch for the floral with geraniums and honeysuckle with chewy toffees. Sweet caramelised oranges, with the honeysuckle floral notes giving this rum an interesting edge. It returns to the sweeter notes you may expect with grated nutmeg over homemade custard tarts, warm honey and almonds, before there are hints of dried apricots. Long and sweet, sticky, chewy, I love the way this coats the entirely of your mouth. There are notes of good quality milk chocolate, honey and warm syrupy oranges with raisins & dates to finish. A collaboration between Maestro Ronero Asbel Morales and esteemed Master Habano sommelier, Fernando Fernandez Milian. Created through carefully selected rum bases matured by natural and total ageing in barrels handpicked by Maestro Ronero Asbel Morales to perfectly match with Cohiba cigars. ‘Havana Club Unión and Cohiba Cigars represent distinguished expressions from the same soil and authentic tradition; their shared origins and rich heritage make them natural partners. It was an honour to collaborate with Cigar Sommelier Fernando Fernandez to create this prestige rum, which presents notes of sweet vanilla, chocolate and dried fruit flavours’. Soft apples, bananas and creamed coconut, honey sweetness, spicy pipe smoke and fresh tobacco. Salted lemons with apricots, pineapple and vanilla whipped cream. Sticky fudge and tropical fruits combine with prunes and a touch of salt, backed up with beeswax and leather and rich drying oak. Bitter coco powder and rich creamy vanilla, but oh that pipe smoke, like being in a humidor, fantastic. Spicy and warming, the kind of heat that warms you like the son. 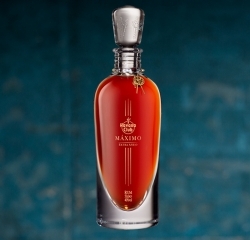 Havana Club Máximo Extra Añejo is handcrafted from rare extra-aged rums and enshrined within an elegant crystal decanter hand-blown by a Master glassmaker. Don José Navarro, Primer Maestro Ronero. So many fruits, plums, raisins, sultanas, brambles, blackberry then furniture polish on wooden floors and black treacle. Sticky caramel, buttery pancakes, banana en flambé, then it’s all change with fresh balsa wood, black pepper, mace and spicy yet fruity hoisin sauce. Prunes, and then a meaty, fleshy steak with a crème brulee and blowtorched marshmallows with homemade vanilla fudge taking this to the next level of sweetness. It starts to dry with tobacco leaves, and cedar wood spice. Oak hiding at the back makes itself known and now the chocolate, dark and milk swirling together with soft grainy pears, melon and ground spices. Polished school floors, with rubber and hemp ropes. Long sweet, viscous, chewy fudge with a meaty melt in the mouth steak. Sweet yet drying tobacco and rich oak and a bitter chocolate espresso to finish. I was already a fan of rum, to be honest I tended to favour a Club 7 with lime and coke, but I had been known to sip rum, and we own one or two good quality sipping rums, so I was really looking forward to this. Once again I am struck between the similarities between rum and whisky. There is so much craftsmanship, the barrels imparting some magic, the range of flavours. 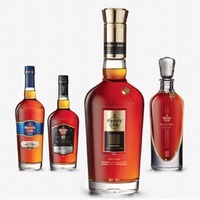 All the rums on tasting were special, and much like whisky there is a vast price range. Does expensive mean better, that’s the age old question, there was a lot to be said for the Havana Club Máximo Extra Aňejo, that said Havana Club Selección de Maestros which was the bottom end of the price range was also fantastic. If you haven’t tried rum before, or passed Havana Club off as a “pub rum”, you could not be more wrong. You need to sample this range, you will be pleased you did.